Similar form experiences to update and view your records. Interactive dashboards across all devices to view your information and drill into it. Reference Panel is now available to be used with all entities supported in Unified Interface. We now support right-to-left (RTL) languages. All experiences on Unified Interface have accessibility improvements. Most of the core functionalities of sales and customer service have moved to the Unified Interface client. You can access all the system and user dashboards from within your Unified Interface apps. The interactive dashboards are now available for all record types with richer interactive dashboard capabilities across the board. If users work on core record types like Activities, Accounts, Contacts, Leads, Opportunities and Cases, you’ll be able to move them to the Unified Interface client. They will have familiar capabilities on Unified Interface and will also discover productivity enhancements with the introduction of some enhanced capabilities. 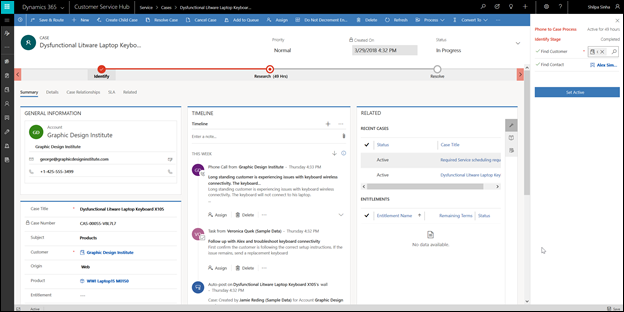 Timeline control – The timeline view helps you collaborate with your team by tracking customer communication in a record on a single page in an easy to read view. You can see everything from posts and voice attachments, to emails and notes. It provides a quick way to see the entire communication thread. Business process enhancement – The business process flow has been improved by the docking mechanism. You can dock the business process stage on your screen to help you stay focused on the task at hand in your business process flow. This is especially useful when the stage of the process has complex steps to complete. Reference panel – Use the reference panel for apps built on Unified Interface like Dynamics 365 for Customer Service. The reference panel is a great way to get work done without clicking away from the screen you are on. You can look up other things like knowledge base articles within the context of the record you are viewing. Navigation – The new menu options let you swiftly navigate the different apps in the system. It provides quick access to recently viewed records and pinned favorites. Reflow – The app also scales by reflowing the components on the screen. The responsive design adapts to your environment based on screen size, so the more available space that you have the more information can be displayed. Unified Interface experiences are based on model-driven apps. You can scope the user experience based on the jobs they need to accomplish. Users can have single or multiple apps based on their requirements and can easily switch between apps as needed. Unified interface is a metadata driven experience. All controls experiences are built on the control framework that is extensible and provides a uniform experience across clients. The app display reflows to the viewport size the user is working on. For more information on availability and how to provision and access Unified Interface, see About Unified Interface. Dynamics 365 App for Outlook is a mode-driven app on the Unified Interface that is now generally available on version 9.0. For more information, see Introducing Dynamics 365 App for Outlook version 9.0. We think you’re really going to enjoy and benefit from the enhancements made possible with Unified Interface and look forward to your feedback.